Dr. Lobsang Sangay, the Kalon Tripa of the Central Tibetan Administration talks exclusively with Saransh Sehgal about the recent self-immolations of Tibetans inside China, his experience serving in a political position once held by the Dalai Lama, and his thoughts on Beijing’s upcoming leadership transition. You recently finished up your first year serving as the Kalon Tripa- what was it like handling the political affairs of the Tibetan exiles? The situation inside Tibet is very grave and Tibetans inside Tibet are suffering tremendously so there are a lot of expectations and the gravity of the situation makes my job difficult. In the last year, however, we have managed to keep the solidarity and Tibetan spirit alive and strong among both the Tibetans inside and outside of Tibet. The international community also has begun to pay more attention to the Tibetans’ cause and many governments have issued statements on behalf of it. Still, we would like to see concrete action from the international community. Unfortunately, the Chinese government hasn’t changed their policies towards Tibet much, and continue to hold onto their hardline policies. We have not made much progress in that area. Overall the last year has been stable, which is in itself notable. There was a high level of anxiety among Tibetans when His Holiness the Dalai Lama devolved all his political authority to the elected leader. This anxiety has subsided considerably and Tibetans are at least beginning to embrace His Holiness the Dalai Lama’s vision where Tibetans will be able to stand on their own feet and lead the movement on their own. You have been traveling across the world since your term began. What types of responses have you been receiving from the governments in some of the major countries around the world? People are generally sympathetic to the issue of Tibet and also willing to issue statements in support of Tibetans. Some governments, however, are far more hesitant to actually pressure the Chinese government to pursue a peaceful solution through dialogue. I should note though that the recent trend has been positive, with more governments now willing to address the issue directly with Beijing. Still, we wish more could be done. You recently admitted during a press conference in New Delhi that the Dalai Lama’s political shoes are hard to fill. What types of difficulties are you facing? Have you faced any domestic criticism from within the exiled Tibetans? It is a little difficult at times. After all, I have just taken over political responsibility from His Holiness, who holds great worldwide acclaim as a Nobel peace laureate, global peace statesman, and world renowned non-violence advocate. So, obviously there are going to be a lot challenges- the job itself is a difficult one. Initial acknowledgement and recognition is also growing, so we are making progress but still have a long way to go. There have been almost 51 self-immolations inside Tibet over the past year. What is the situation inside Tibet now? The situation inside Tibet is very serious; the Chinese government has essentially shut down Tibet with no tourists or journalists being allowed in. The Tibetans who resident outside the capital city of Lhasa are being chased out when they visit. Even residents of Lhasa have to live in an environment of fear- for instance, there are checkpoints set up every few miles- which goes against one’s nature as a human being and social animal. The Chinese government has created this system with their repressive policies. This is very sad. Of the 51 self-immolations, 41 have died. That speaks to just how grave and desperate the situation is that Tibetans are choosing to die than to leave. What signals are you getting from Tibetans inside Tibet? They say it is so oppressive under Chinese rule that it isn’t even worth living, which is why they are self-immolating. At the same time, across the three Tibetan regions solidarity and spirit remain so strong that they have neither given up nor given in but instead continue to resist the Chinese policies. It seems to me that the international community’s response to the self-immolations has been rather lackluster, especially with regards to placing pressure on the Chinese government. What are your views? It is very unfortunate. We welcome statements and appreciate sympathies but we would like to see these be followed with concrete actions to press the Chinese government. We’d like the foreign delegations visiting China to be allowed to visit Tibetan areas and investigate what is going on so the truth will come out. The Chinese government accuses us [Tibetan Exiles] of not telling the truth but we also cannot accept what the Chinese government says as truth based on its word alone. If the Chinese government is telling the truth then it should allow the international community to visit Tibet and verify the Chinese government’s statements. And the international community too should be saying to the Chinese government that we want access to the Tibetan regions to determine what’s going on for ourselves. This will determine how best to move forward and the international community could even give suggestions and recommendations to the Chinese government on how best to move forward as well. What are the United States and India’s stances on the Tibet issue? India has done the most for the Tibetan people because the Tibet administration is based here, large numbers of Tibetans reside here, and Tibetan schools are subsidized by the Indian government so we are the byproduct of that general humanitarian consideration. As far as the United States is concerned, Secretary of State Hillary Clinton recently urged the Chinese government to enter into dialogue with the Tibetan leadership to solve the issue of Tibet. And also some Congressmen have suggested there should be a contact group with a multilateral approach to solving the issue. All these ideas are welcome but we would like to see some concrete results. What are your views on the failed China-Tibet talks? There has been a stalemate mainly because of the hardline policies of the Chinese government – they have maintained an opaque process where they have never given us any clear indication. We wish for an earnest and substantive dialogue; their lack of willingness has stalled the process. The Dalai Lama’s two envoys to the talks with Beijing resigned this year. What message does this send? By resigning they made it clear that given the deteriorating situation in Tibet since 2008, and with the growing number of self-immolations, they face utter frustration but lack a response from the Chinese government. From our side the envoys have said they were willing to enter into a dialogue but between January 2010 and June 2012 the Chinese government did not give a positive response to these overtures. The envoys resigned to make clear that for the time being they do not see any prospect for a dialogue. Now whenever there is once again a prospect for dialogue in the future, hopefully after the changes in the leadership in China, we are still willing to enter into dialogue anytime, anywhere. Who would be the next person to serve as the envoy in talks with Beijing? Through the end of this year there will be changes in China’s leadership. We want to see how that goes. We do not have a deadline as such. As soon as the Chinese government is willing and ready for talks again, we will have the new envoys of His Holiness the Dalai Lama ready to enter into a dialogue. The onus of the entire Tibetan struggle is on you now. How do you feel about this? It is a very difficult job that someone has got to do and the fact is that I have been chosen for the position. I can’t complain nor do I wish to give up. I’m determined to carry forward the flag and work hard on behalf of the Tibetan cause, which is to solve the issue non-violently through dialogue. In a recent interview the Dalai Lama expressed some hope about what China’s leadership transition could mean for Tibetans. Do you expect a breakthrough once the new administration assumes power in Beijing this year? I am hopeful that with new leadership there will be new people, new thinking and new policies – that there will be any sort of change. But given the past 50 years we do not have strong reasons to be optimistic. 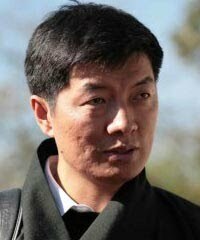 Most Tibetan exiles expect you to advance talks with the Chinese, are you in any communication with Chinese officials? I have the political responsibility for this as the administrative head so it will be our decision. We have been in informal communication but no formal ones as of yet. Could we also expect any future administrative or political role for the 17th Karmapa Ogyen Trinley Dorjee in the exiled Tibetan movement? Not as of yet but maybe if people elect him. Any Tibetan is eligible for election and our voting system is set up so that anyone can nominate anybody else. Then it’s up to him to stay in as a candidate or not. The 2nd Special General Meeting of Tibetans is coming up at the end of September. Can you tell us what will be discussed in the meeting? What do you consider your biggest achievement so far during your time as Kalon Tripa of the Central Tibetan Administration? I have made some progress in keeping the solidarity and Tibetan spirit alive and strong, raised the profile of the Tibetan issue within the international community, and pressed the Chinese government to solve the issue. I have also made some progress domestically in the areas of administrative reforms, education, and information technology. Do you think the middle way policy advocated by the Dalai Lama and you will ever succeed? Yes, that is why I have returned from America; I have left my job at Harvard and everything else to come here and deal with the situation in a hands-on way. We will see that day sooner or later.